9.1. What weight of water would have to evaporate from 1 m3 of water to produce a temperature decrease of 1 degree celsius? How much energy would be released to the atmosphere when this vapor condensed? 9.2. What would be the temperature decrease required in 1 M3 of water to increase the temperature of an equal volume of air by 1 degree celsius? Assume 25°C where the density of air is 1.1843 x 10~3 g/ml, and no evaporation. 9.3. Henry's law constant for 02 in water at 25°C is 1.28x 10~3 mole liter_1atm_1. 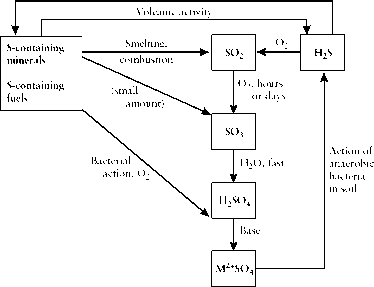 (a) What is the concentration of dissolved oxygen in moles per liter? In grams per liter? In ppm? (b) How many grams of organic material (CH20)n could be converted to carbon dioxide per liter of air-saturated water? 9.4. What is the concentration of Cd2+ in water in contact with cadmium carbonate with a bicarbonate ion concentration of 1 x 10~3 mole/liter at a pH of 4? KSp, CdC03 = 5.2 x 10~12. 9.5. What is the predominant species in a carbonate solution at pH 2? At pH 7? At pH 11? 9.6. List some acids that are important in the environment. Why is each important? What are the sources? 9.7. Explain the cause of stratification in a lake. 9.8. The pH expected for rainwater under unpolluted conditions is around 5.6. Explain why this value is expected. 9.9. The pKa of hypochlorous acid is 7.5; that of HF is 3.18. Which is the stronger acid? Which acid contains the stronger conjugate base? 9.10. If a liter of water is saturated with CO2 at 25°C and 5 atm pressure, how many grams of CO2 would be released if the pressure were reduced to 1 atm. and the system equilibrated? 9.11. The solubility product for cadmium sulfide is 8 x 10~27, assuming the reaction is CdS ^ Cd2+ + S2~. (a) Calculate the concentration of dissolved Cd2+ in pure water. (b) Since S2~ is a strong Bransted base, what will the actual process be? (c) Find the equilibrium constant for the actual process from the equilibrium constants that are available, and from this find the Cd2+ concentration at pH 7 and 4. 9.13. In a solution containing the following metal ions and ligands, match up the most likely metal-ligand combinations: Ca2+, Cu2+, Pb2+, NH3, HS~, H2PO3. 9.14. (a) Write the equation for the reaction for the dissolution of CdS in water containing the ligand EDTA. (b) From the standard expressions for the solubility product, the formation constant and the ionization constants of the acid EDTA, derive an expression and the value for the equilibrium constant for the reaction in part a. (c) Use the results of part b to explain the pH dependence of the solubility of CdS under these conditions. 9.15 The pK value for the formation constant of [AuCl2]+ is 9.8. What fraction of Au(III) in a solution that is 10~2 M Au(III) and 0.05 M CP is present as the complex, assuming no other species are found? 9.16. At what value of pE and EH would NO3 and NO2 be in equilibrium at pH 5? 9.17. Discuss how metal ions could be complexed by humic acid. Eh and pE are required for this to be stable with respect to MnO2? (b) What value of POl would this correspond to? (c) Would you expect aqua complexes of iron to be soluble under these conditions? If so, in what state? 9.19. If a gram of a solid substance of density 1g/cm3 were divided into colloidal particles that were 10 ^m sized cubes, what would the surface area be? 9.20. Figure 9-13 shows the variation of solubility of calcium carbonate with pH. Explain the changes in slope of the plot of pH vs log C.
9.21. A 100-g sample of a montmorillonite clay was found to be able to absorb 1.85 g of sodium ions at saturation. What is its ion exchange capacity? What weight of Cd could be held (as Cd2+) by the clay? 9.22. MnO2 (solid) can be reduced to soluble Mn(II). (a) Give the equation for the half-reaction. (b) What potential would be required to give a concentration of Mn(II) of 1 x 10-4 at pH 7? (c) What equilibrium oxygen pressure would this correspond to?